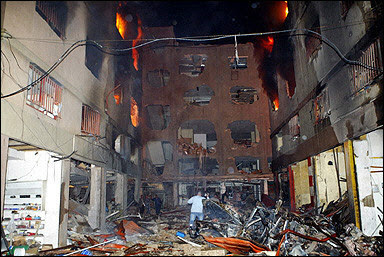 Another explosion took place in the upper sector of the Industrial City of Bauchrieh on Friday 26th of March 2005 around 9:30pm. 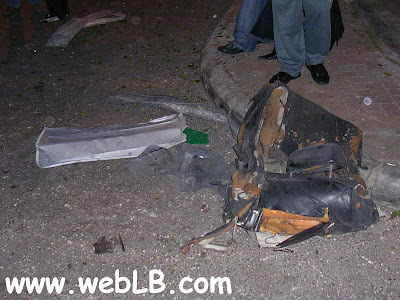 At least five people were injured. 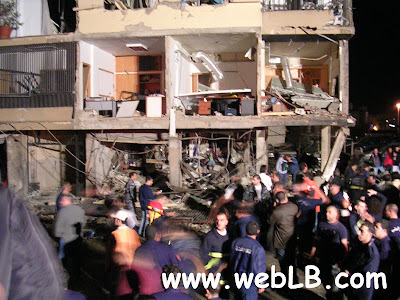 Tuesday night, around 1:30am Beirut time (early Wednesday), a bomb exploded in the Alta Vista center in Kaslik, Lebanon. 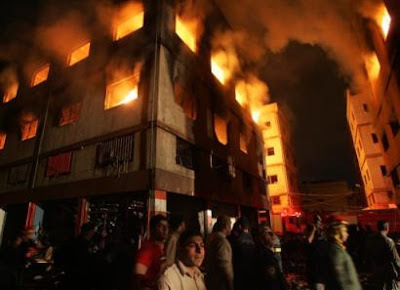 Reports indicate that 3 Indian workers were killed. There are also reports of some injuries. I couldn't personally take photos, but you can click here to see those which were being forwarded by email. Earlier this year, I read that Lebanon will be participating in the Eurovison song contest where people from all participating countries vote for their favorite candidate. Aline Lahoud was selected to represent Lebanon. She was awarded the Special Award Trophy of the FIDOF (Fédération Internationale de lOrganisation des Festivals) during the Megahit Festival in Turkey in September 2004. Jad Rahbani composed the song she was supposed to sing. Yes, "was", since Télé Liban (the state run TV station covering the event in Lebanon) decided to withdraw from the competition. 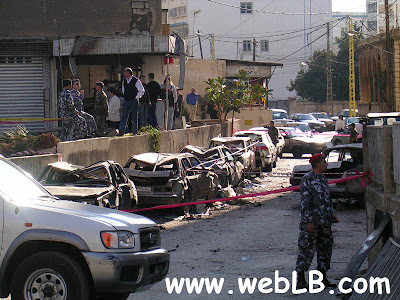 Yeah well, apparently, Israel will be participating too and that won't work for the Lebanese government. But hey, Israel also participates in Miss World and Miss Universe and Lebanon never withdrew from these competitions! Anyway, regardless of poor Aline's and Jad's shattered dreams, Télé Liban now has to pay a penalty fee for withdrawing late using taxpayers money. 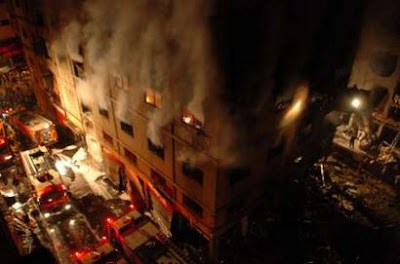 My parents were asleep and I was browsing the Internet when I heard a strong explosion. 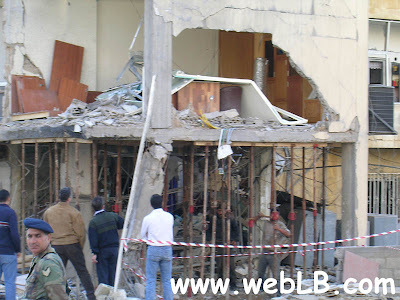 The doors and windows shook so strong. First, I thought it was Israeli airplanes breaking the sound barrier. My mother woke up and we called my brother to make sure he was okay, not knowing the exact source of the sound yet. We turned on the TV and started zapping between CNN, Euronews and local stations waiting for some news flash. Meanwhile I was searching the net and asking on chatrooms if anybody knew what happened. 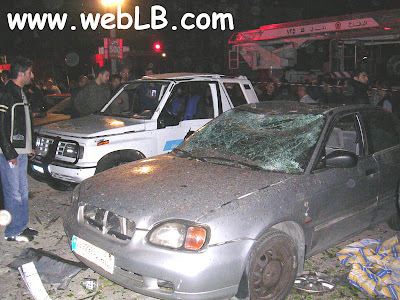 Around 12:40 am, LBC, a local TV station, said there was a car bomb in Jdeideh... We were shocked. Jdeideh is the 1km2 city where I live. I quickly jumped into my car to try to locate the area. I asked some people on the streets and they told me where it happened. I parked my car a bit far so I could easily get out on my way back and avoid traffic jams. On my way, I saw an old friend who was rushing to the scene. He told me his father's medical clinic was damaged, but all I could see was lots of people and firefighters trucks. 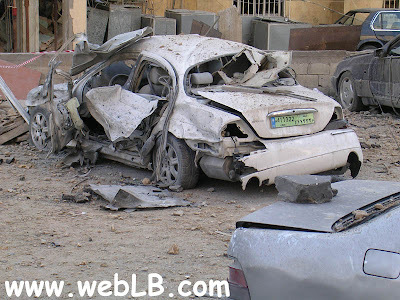 I then saw glass shattered all over, cars deformed by the blast, and the passenger seats of the car which was blown away. 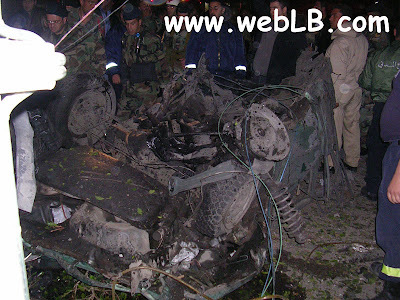 After sneaking-in between two of them, I saw the remains of the car in which the bomb was planted. 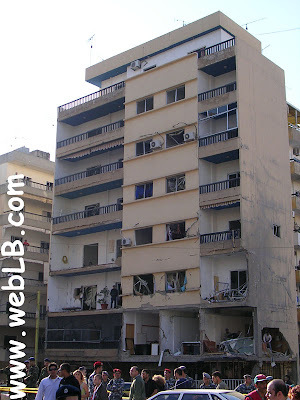 I then turned left and I saw the front side of the building completely damaged. 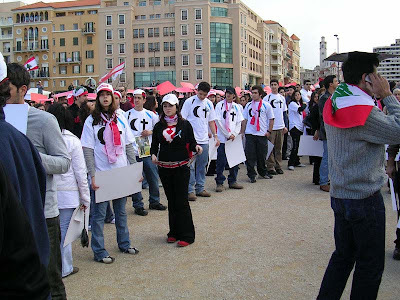 Following calls made by opposition figures, the FREE Lebanese people decided to take on the streets of Beirut heading to Martyr's Square aka Freedom Square on March 14th, 2005. Below are some photos and links... Enjoy!!! 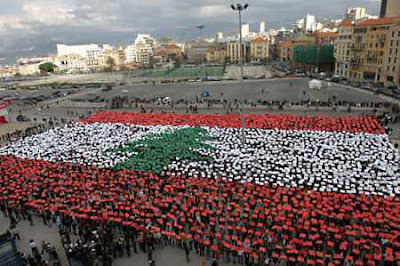 Earlier this week, calls were being made among the Lebanese population in order to make a human Lebanese flag in Freedom Square, Beirut. I decided to go with some friends to take part of this event. I got there around 2:00pm, and the area was almost filled by participants. The red parts of the flag were already full, and a small area of the white part had yet to be filled. The organizers gave us a white cardboard and directed us to the designated area. After some tests, the crowd was ready. The ceremony started with the national anthem. 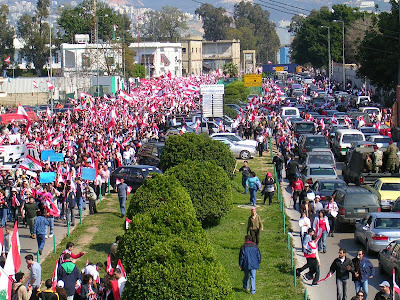 Upon the signal, all the participants raised the cardboards to form the Lebanese Flag. 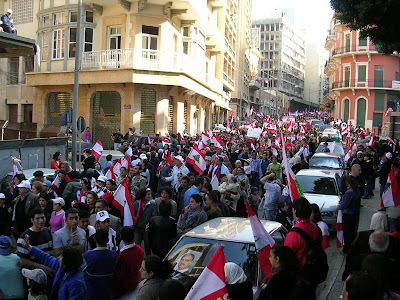 The crowd then called for "sovereignty, freedom and independence". 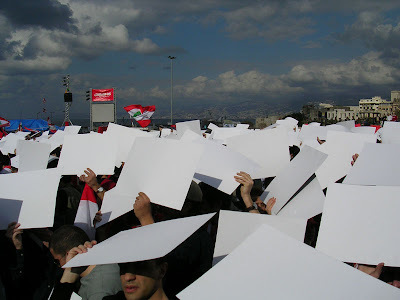 Green, white and red cardboards were being flipped to their black side when the speaker referred to the Syrian government or its Lebanese representative. 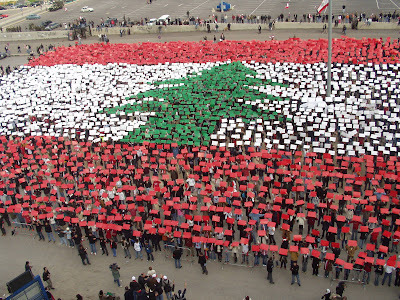 Then, when demanding for independence, the cardboards were flipped again to the colored part and form the Lebanese flag. Below are some photos of the event. I will post more as soon as I get them. A new term has been added to the Lebanese political jargon : ZOOM OUT. 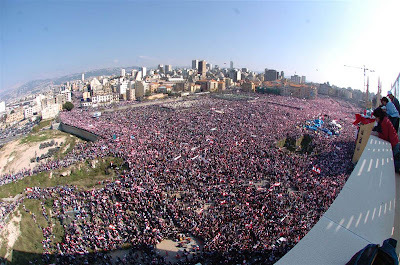 In order to downsize the estimations of protesters in Lebanon, some politicians are arguing that the cameras are not taking wide shots, and only zooming on smaller groups of people. Being Lebanese, a synonym of pride, protesters are now defying these politicians by branding "ZOOM OUT" signs in their demonstrations. Regardless of the actual number of protesters, I believe that at least, with a closeup or ZOOM IN, we can actually see Lebanese people... Unlike the ZOOM OUT of the "1 million person" demonstration held last November. 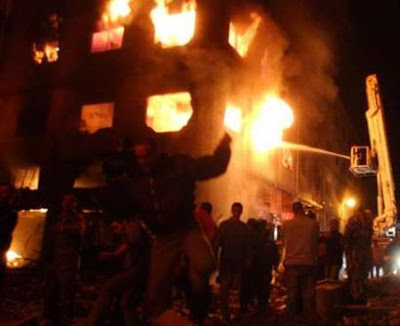 I heard today some stories about provocations and shots fired in Ashrafieh, Beirut on Saturday night. No political comments are allowed ! An 18 years old wounded by shots fired on Sunday Night.